President Donald Trump says congressional negotiations over border security are a "waste of time," while insisting he has "set the stage" to take action on his own if lawmakers don't provide funding for his border wall. Trump tells The New York Times in an interview published Thursday night that House Speaker Nancy Pelosi "is hurting our country very badly by doing what's she doing and, ultimately, I think I've set the table very nicely." Trump adds: "I'll continue to build the wall, and we'll get the wall finished. Now whether or not I declare a national emergency - that you'll see." The progressives say the Homeland Security Department's budget should be cut, not enlarged, because it has an "inhumane" agenda toward immigrants and children. In a letter circulated Thursday, they say next year's budget offers a chance to "reform" the agency. They add, "In the meantime, not another dollar." Democrats are offering further details of their border security plan. They unveiled a measure Thursday that would not provide money for President Donald Trump's U.S.-Mexico border wall and denying his request for additional border agents. The move ignores Trump's warnings that they'd be wasting their time if they don't come up with wall money. Pence says President Donald Trump is calling for an "all of the above strategy" to keep illicit drugs out of the country, "but all of the above includes a wall." Pence spoke to several dozen agency employees. He says the administration will fight for a physical barrier in "critical, high-density areas where our law enforcement community says it's most needed." President Donald Trump says he's not waiting on Congress to move forward with building his long-promised southern border wall. Trump pointed to work that's already underway at the U.S.-Mexico border with funding previously appropriated. Trump also suggested he's still weighing the option of using his executive powers to declare a national emergency if necessary. Such a move would almost certainly face legal challenges. Trump told reporters Thursday at the White House: "I'm not waiting for this committee." He's referring to the bipartisan group of lawmakers that met for the first time Wednesday to try to hash out a border security deal before the government runs out of funding again on Feb. 15. 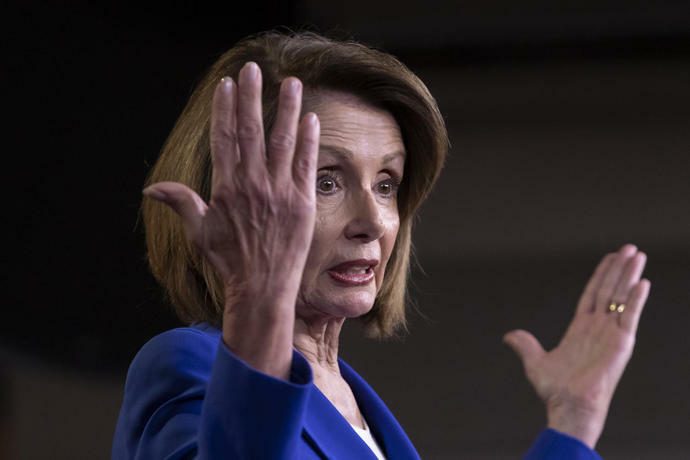 House Speaker Nancy Pelosi said Thursday that whatever deal is reached will not include money for Trump's proposed wall. Trump accused Pelosi of "playing games" and says: "If they don't give us a wall it doesn't work." House Speaker Nancy Pelosi says there will be no money for President Donald Trump's border wall in any deal to keep the government open past a Feb. 15 deadline. A bipartisan group of House-Senate negotiators met for the first time Wednesday, and Pelosi addressed the issue at a session with reporters on Thursday. The California Democrat said she wants to see the negotiators' bipartisan bill by next Friday. She told a news conference: "There will not be any wall money in the legislation." Trump took to Twitter on Thursday, appearing to sour on the congressional talks and tweeting that Republicans are "wasting their time" trying to negotiate with Democrats. President Donald Trump says Republicans are "wasting their time" trying to negotiate with Democrats over border wall funding. And he says he doesn't "expect much help" from Congress in getting it built. Trump's comments Thursday came the day after Democrats offered no money for Trump's long-promised wall during the first day of congressional talks on border security funding. Trump last week signed a three-week deal to reopen the government, giving Congress time to try to hash out a deal. He's threatened to declare a national emergency to circumvent Congress if they fail to reach a deal he can sign. He says, "Democrats, despite all of the evidence, proof and Caravans coming, are not going to give money to build the DESPERATELY needed WALL." But he adds: "I've got you covered. Wall is already being built, I don't expect much help!" As congressional negotiators opened talks Wednesday on border security funding, Democrats offered no money for Trump's wall. Republicans angling for compromise have shifted from using the word "wall" in favor of the word "barrier." Trump used all capital letters in tweets Thursday as he addressed the rhetorical shift: "Lets just call them WALLS from now on and stop playing political games!" He says: "A WALL is a WALL!" Nevertheless, Trump in recent weeks had also modified his rhetoric, saying he wants "steel slats" along the border rather than the "concrete wall" he promised during his campaign. He said he hoped that wording would be more palatable to Democrats and that, whether it's called a "barrier," ''wall," ''steel slats" - and even "Peaches," at one point - "whatever you want to call it, it's all the same." The Democratic proposal includes new money for customs agents, scanners, aircraft and boats to police the border, and to provide humanitarian assistance for migrants. Missing is money for President Donald Trump's southern border wall. Ahead of Wednesday's opening round, Trump tweeted that Democrats are "wasting their time" if they don't offer money for the wall.